The National Occupational Standards (NOS) developed by LSSSDC are laid down and validated by employers in Life Sciences Sector through multiple level of interactions and engagement with LSSSDC. National Occupational Standards (NOS) specify the standard of performance an individual must achieve when carrying out a function in the workplace, together with the knowledge and understanding they need to meet that standard consistently. Each NOS defines one key function in a job role. Each NOS is a concise and readable document, usually consisting of no more than five or six pages (some are only one or two). NOS always have measurable outcomes as “Performance Criteria”. Often NOS are misunderstood by many as Courses / Training Programs / Units / Qualifications/ Curriculum. Description of functions, standards of performance and knowledge/understanding. Developed/ laid out by/with Employers. 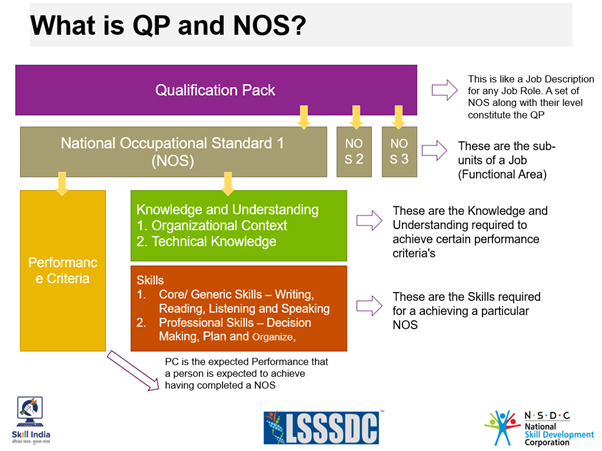 A set of NOS, aligned to a job role, called Qualification Pack, would be available for every job role in Life Sciences sector. Each Qualification Pack is benchmarked at a specific Skill/ Competency level as per National Skill Qualification Framework (NSQF). A Qualification Pack aligned to NSQF drives both the creation of a course, curriculum & content, and assessments. Thus NSQF makes it possible to drive competency/ outcome based training and assessment for every job role in industry. Such NSQF aligned Qualification Pack along with its curriculum and assessment guidelines is then approved by National Skills Qualification Committee (NSQC) as Indian Vocational Qualification and is them listed in National Qualification Register (NQR). It would be possible for all current vocational courses, like MES, ITI Courses, or similar vocational courses in schools, colleges and polytechnics to be aligned to job roles at specific NSQF Levels. An ITI Course in Fitter/ Mechanical would say they are training for Machine /Production Operator at NVQF Level 4. Similarly a pharmacy college, training in pharmacy, may say it is training for NVQF Level 5 for Production Chemist. At LSSSDC, we understand the importance of usability of the documents developed, hence have prepared a self-help manual for all users to read and use the Qualification Pack Document.